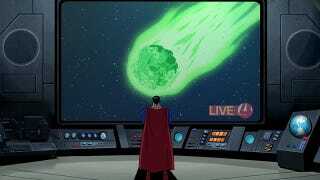 “Kryptonite” is a fictional material that brings down Superman, but the element krypton actually exists, and molecules that end in “ite” actually exist. Why can’t we make kryptonite? Chemistry is one of those sciences that gives us tons of information up front, if only we’re educated enough to use it. (Remember high school tests, during which the chemistry teacher loudly announced that all the information you could ever need was on the periodic table at the front of the class? I hated those.) One of the ways it gives this information is through the names of each chemical. Each sound in the name is supposed to clue us in to a component of the molecule. So if you hear the word “ite,” at the end of a molecule’s name, you should know a few things about it. The name kryptonite indicates that the molecule is an oxyanion. An anion is a negatively-charged molecule with multiple oxygen atoms attached. Most of the time, when you hear about these oxyanions, you hear about “ates” not “ites.” Nitrate (potassium nitrate makes smoke bombs) is NO3- , sulfate (potassium sulfate makes fertilizer) is SO42-, and carbonate (calcium carbonate is in shells and chalk) is CO32-. “Ites” have the same negative charge as “ates,” but have one less oxygen atom. So nitrite is NO2-, and sulfite is SO32-. Hw many oxygen atoms and what charge does kryptonite have? None. Krypton is a noble gas, and doesn’t combine with oxygen. For a long time, people thought it couldn’t combine with anything at all. It was only in 1960 that scientists finally managed to combine krypton with fluorine. Fluorine is the most reactive chemical element we know of, and it still took a temperature of −183 °C to get it to hook up with krypton. There is no kryptonite. At least, there is no kryptonite except the kind we define ourselves. In Superman Returns, Lex Luthor steals a box labelled “sodium lithium boron silicate hydroxide,” which turns out to be kryptonite. In 2007, that same chemical was discovered in a Serbian mine.